Founder/Director of HEROES, I am a messenger of a sensible, universal, timely and timeless message: Just as athletes optimize their athletic fitness according to training principles to gain mastery in sports, so do we optimize psycho-social fitness according to the very same principles in order to gain mastery in life. This mastery is known as "resiliency." When we champion ourselves with resiliency, we demonstrate a personal heroism that, though we receive no gold medal, is deserving of the highest honor. In the athletic arena, we celebrate elite athletes for the Strength, Endurance, and Power that allow them to highlight their talent. In individual sports, such as weight lifting, track and field, and swimming, an acronym exists for athletes’ optimal performances—their “PB”—their Personal Best. The key to the Resiliency Fitness Paradigm lies in how we exercise our Strength, Endurance, and Power in life. The Paradigm speaks to psychosocial fitness, blending both the psychological and social self, and how well suited we are to respond so that we suffer less. The issue is complex because Resiliency rarely has statistics (except, for example, when counting money or persons). Nevertheless, we can judiciously assess our own Personal Best based on quality of life and the quality of our relationships. Consider weight-lifters: These athletes encounter challenges to Strength, Endurance, and Power in accordance with three training principles—Overload, Recovery, and Adaptation. The weight that they lift pushes their abilities to the limit. They Recover in between workouts, and their muscles and cardiovascular system Adapt. With consistent effort over time, their Personal Best improves. Consider you and me: We encounter challenges to our Strength, Endurance, and Power. Life delivers crises that Overload our sensibilities; some feel more manageable than others, but life tests our ability to respond. Putting aside our shortcomings, we exercise our competencies to the best of our abilities, our Personal Best. We eventually enter a period of Recovery. As we gain perspective, if we are wise, the lessons we glean yield to Adaptation—we know better. Adaptation gives us the “magic” ingredient for future reference, feeding our Personal Best for the next Overload. WHY INVEST IN PSYCHOSOCIAL FITNESS? Failing to properly grieve a break-up, we may avoid future loving partnerships. Avoiding medical care may threaten a timely prognosis and lead to premature death. Difficulties in establishing intimate friendships may impede necessary happiness. Endowed with a native inclination to solve problems, we need not await crises before we test our Personal Best. Resiliency and thriving take root in our conscious mind, lying dormant until we decide to cultivate them. At the very least we avert dysfunction; at the very best we invite prosperity. In a world that often hails winners over losers, where competition often pegs profit against loss, let us shift our consciousness to our Personal Best. HEROES Resiliency Fitness Training guides the co-creative process of personal development that supports resiliency and thriving. I can facilitate your cultivation of Strength, Endurance, Power, and more through individual and group resiliency coaching—Co-Creative Transformation. Contact me, Vanessa Landau, Resiliency Coach,, and we will work together to invite your HEROISM! The hour hovered around midnight and my mother slept in her bedroom. I cried in mine. I often cried privately at home (and publicly at school). My mother lent ample cause to my distress—rejecting my individuality, issuing tirades at my expense, and being unwilling to take responsibility for the harm she perpetrated. At 15, having worked with LICSWs (social workers/psychotherapists) and the public school psychologist for years, I knew that my mental health presented crises. No practitioner ever reported a diagnosis to me, but I had read about Major Depression, and I knew I lived with it. I left my house in the middle of the night, taking a taxi to the Emergency Room at Franklin General Hospital. The explanatory note that I left on the kitchen table read: I went to the hospital to find out why I get so sad all the time. Because I was underage, the hospital could not admit me without parental consent. I feared my mother’s wrath were the hospital to call in the wee hours and wake her. As second thoughts arose, regarding whether she would consent to my initiation of an inpatient stay or perceive this as a public embarrassment, a reproach for her parenting skills, and spurning of our home life, I opted not to wait until morning only to have her come and get me. I needed the power of an authority on my side. Not finding any, I aborted this request for help and opted to walk home, arriving home by dawn, removing the note from the kitchen table, and returning to sleep with voiceless desperation. What child takes herself to the Emergency Room and asks for a psychiatric admission? What Strength! My gumption to call a taxi and walk myself into an ER manifested maturity and sheer courage. By yielding to my vulnerability and taking measures to ask for help, I demonstrated fortitude. The resourcefulness to seek medical help reflected the asset of education. What Endurance! I had carried my burden—albeit with copious tears—with keen personal insight. My perseverance despite crushing emotional pain spoke to tremendous patience. The patience did not feel like patience, or like any asset at all, yet somehow day upon day my mind continued to trouble-shoot and problem solve. What Power! In the face of mental illness, there seemed to be absolute powerlessness—a sickness that I could not control. This truth of this perception prevailed for me. Yet I owned my response. I possessed the power to choose the next right step for me and the autonomy—the self-governance—to take it. The failure of my orchestration to get medical help frustrated, disappointed, and dismayed me, but the attempt spoke to an irrevocable triumph: I had advocated for myself. Resourcefulness, insight, autonomy, and self-advocacy facilitated a heroism that, at the time, I could not appreciate but today is undeniable. Heroism can be vividly dramatic, as in my story, and it can be ordinarily extraordinary. Among the nine competencies—including STRENGTH – ENDURANCE – POWER—heroism develops through grave hardship and through unpretentious dedication. We cultivate it through examination of how we focus our time and attention, how patterns of relationship and work contribute to our personal growth, and how our reactions and decisions take root and take wing. Do you know that we were born to be our own HEROES? Did you hesitate to answer? Did you answer “yes” resolutely? HEROES Resiliency Fitness Training guides the co-creative process of personal development that supports resiliency and thriving. I can facilitate your cultivation of Strength, Endurance, Power, and more through private resiliency coaching—Co-Creative Transformation. Contact me, Vanessa Landau, Resiliency Coach,, and we will work together to invite your HEROISM! Continuing my progress from there, I believed that I was keeping my “side of the sidewalk” clean. Maybe so… but last week I discovered that, just like baking a cake, if we skip a Step, we may not wind up with cake! I recently conducted yet another Fourth Step which included misdeeds of the past that, although confessed along the way and for which I had made amends, re-emerged at this stage of my recovery in the form of lack of self-forgiveness. The inventory also revealed uncomfortable qualities that I hide in shame–my shadow side–such as irritation, judgment, contempt, impatience. This time I prepared for a Fifth Step, and a fellow Twelve-Stepper, Laurie, agreed to listen. We discussed my greatest misdeeds, which cannot be erased, and the plague on my conscience. I have lived up to the prophetic notion that We suffer with the objects of our vengeance. The take-away spoke to a need for skills when hurt, anger, and frustration merge. I need to learn how to self-soothe when feeling powerless and distraught. My challenge at these times pertains to discretion and restraint when I most wish to lash out. Otherwise, the cost that life exacts is chronic self-recrimination. Laurie also helped me to see that I am so entrenched on an ego-level with being nice, open, and accepting of others that I sacrifice my True Self rather than rejecting friendship with someone whom I would rather not be friends. Unfortunately, I enter prematurely into a bond, and then proceed with friendships that later evoke ugly qualities that I hide–irritation, judgment, contempt, impatience. I am not so nice, open, and accepting after all. The True Self prefers connection with people whom I admire. If this is the case, I must reach out to such people. The other aspect of the Fifth Step involves assets. Regarding the finer qualities that I possess, I proudly own…responsible, reliable, thoughtful, affectionate, generous, cooperative, grateful. Laurie noticed that I assess my virtue in relation to my usefulness to others. The challenge this presents points to my ownership of my innate value. We can only heal and grow with the witnessing and nurturing of others. We can only rise above ourselves with the clarity and feedback of others. We can only transform our lives with the cooperation of others. This is the bottom line for Resiliency Coaching. If you desire the benefit of an inventory of your life, Contact me, Vanessa Landau, Resiliency Coach, for Co-Creative Transformation, and we will work together to improve your life! What is stronger than concrete but weaker than love? There is no correct answer, only supposition. Think for a moment before you continue. I assert PERCEPTION is stronger than concrete but weaker than love. How is perception stronger than concrete? 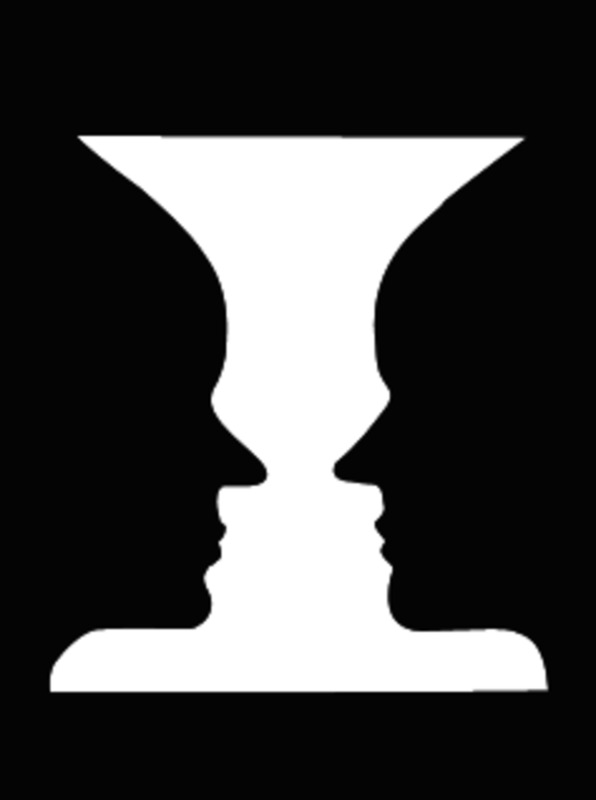 What is “perception”? … the act or faculty of comprehending by means of the senses or of the mind.” More specifically, I believe that perception is the particular experience of a stimulus—a thing, a sensation, or an issue—from the perspective of a particular person. Two different people may respond to the same stimulus in two different ways. For example, what do you perceive this image to be? Either way we respond, both perceptions are true. Our point of view or interpretation becomes a Truth which establishes the backbone of our actions and responses in the world. Our Truth informs the thoughts, attitudes, and beliefs, principles and values, emotions, and behaviors that make sense to us. Our Truth informs the way we get our needs and desires met. Our Truth informs our best judgment and our ability to understand and cope with experience. The aggregate of our perceptions forms the basis of our very lives, and the earlier or greater the impact of our perceptions, the more formative the experience. In this way, perception, like concrete, structures experience and structure provides security. To ensure our security, we will defend our perceptions and insist that we are, at most, correct or, at least, more sensible or more justified than others. For example, some people believe that climate change is a fiction. Allegations have been made that scientists and institutions involved in global warming research are part of a global scientific conspiracy or engaged in a manipulative hoax. Some of us contest the conspiracy theory and perceive abundant evidence that climate change currently threatens planet Earth as predicted. In this matter, perception may be stronger than concrete. How is perception weaker than love? What is “love”? … a feeling of warm personal attachment and affection. More specifically, “love” to me means a warm personal attachment based on trust and good will that promotes personal growth for the parties involved. When we love, we assign credibility to another, and we allow ourselves to feel vulnerable to another. In doing so, we become susceptible to influence. Our perceptions may become flexible, and our thoughts, attitudes, and beliefs, principles and values, emotions, and behaviors may shift. For example, we may change our attitudes and habits about diet and exercise, convert to a different religion, or bend our political leanings. Whether we unconsciously wish to avoid conflict and to be accepted, whether we feel confused and undecided, or whether we intentionally shift our perspective, we may be more receptive to what a loved one has to say than to what a stranger has to say. In this way, when attachment based on trust and good will are at stake, perception may be weaker than love. Do you have STRENGTH and FLEXIBILITY to establish your point of view and to receive others’ points of view even if they contradict established interpretation of reality. If striking this balance challenges or confuses you, Contact Vanessa Landau, Resiliency Trainer, for Co-Creative Transformation, and we will bring clarity to your perceptions. I once based my world on the Love of a lifetime. When the object of my affections withdrew, I broke. My long-held dismissal of marriage evoked an attitude that, within the bounds of a relationship, if my partner no longer loves me, then he needs to leave. However, once I felt the bond of Love to which I had laid my soul bare, relinquishing the attachment tore apart my heart and my mind. Within the laws of the universe, he didn’t do anything to me to which I did not implicitly consent. He owed me nothing but a courteous good-bye. I am the one who based my world on this Love that I felt and that he ultimately did not. I endorsed his freedom to make his own decision about Love, choosing “me” or “not me.” How could I do otherwise? The disappointment so complete, I am left to puzzle the damage. Political correctness suggests that I wish him well, but I do not. In fact, I resent that he ever comes to mind, sneaking in when an empty space in my thoughts or something reminiscent occurs. Sadly, his abandonment will never go away so I must manage the impact. The best I can do with the fact that our past will always be part of my life in the sour way that curdled milk feels at the back of the throat–too late to un-swallow–is to put less importance on his interference in the present, neither inviting nor resisting it. With time I hope that the ill he brought upon me will transform robbery into apathy. If his leaving makes room for a more suitable relationship, my appreciation for the turn of fortune may well instill a cautious optimism. Now I know what it feels like to be decimated by someone who claimed to have loved me at one point and then chose not to love me when the time came to choose. If you know what it is to grieve for the living and need guidance along the recovery process, please Contact Vanessa Landau, Resiliency Trainer, for Co-Creative Transformation, and we will invite a paradigm shift that brings clarity. A friend of mine thinks that if she reaches out to a neighbor in friendship after so many years of silence, she will come under judgment and criticism or be subject to questions about her motives. As a result of this thinking, she remains isolated in her community. I suspect the fundamental beliefs that inhibit her exceed these surface concerns. Whatever her primal concerns are, she will not question the way in which she explains them to herself. She believes the story she tells herself. Were the situation were reversed–if a neighbor reached out to her after all these years–would she judge and criticize them or deem their motives questionable? Ultimately, the prospect of meaningful connection and rewarding relationship gets mired down by fear of connection and exposure. We convince ourselves of many notions because we think them. However, our perceptions may be skewed by negative assessments that are questionable if not untrue. David Burns, MD wrote a book on cognitive behavioral therapy entitled Feeling Good: The New Mood Therapy which delineates ten (10) cognitive (thought) distortions that dictate our beliefs and shape our mood. All or Nothing Thinking: If I am not successful, then I am a failure. Over-generalization: My friend ditched me. Everybody ditches me. Mental Filter: I messed up in the middle of my speech; the presentation went terribly. Discounting the Positives: I won that award due to sympathy and not merit. Magnification/Minimization: I need to lose weight. I look like a hippopotamus. – and – This work assignment is too tough. I can’t do anything right. Emotional reasoning: I feel incompetent. I must be unqualified for this job. “Should” Statements: I only accomplished three things today. I should have more discipline. Labeling: That was such a stupid mistake. I am a complete idiot! Blame: The group project earned a C-. I probably dragged the group down. – or – She told me to “go for it”! She is the reason that I wasted money on dance lessons. Disarm thought distortions through the analysis of assumptions and irrational errors that APPEAR real. When we make harsh judgments and criticisms about ourselves (and others), we risk forfeiting ACCURACY, dearly underestimating STRENGTH, and essentially undermining POWER. Similarly, when we give in to fear, we likely languish in or succumb to a lower resiliency status. The next time we tell ourselves a story about why and how we cannot rise above limitations, we must remember that we can’t always believe everything we think. And the next time we uncover fear at the root of limitations, we must remember that we can Face Everything And Respond! If you are ready and willing to challenge your thinking, re-evaluate your “story,” and make rational decisions about your Life, please Contact Vanessa Landau, Resiliency Trainer, for Co-Creative Transformation, and we will invite a paradigm shift that brings clarity. You have got genius inside of you! That is a fact. Discovering the roots of that genius and cultivating it depends upon your IQ. I am not referring to the standardized, culturally-biased Intelligence Quotient. Neither am I referring to any particular cognitive talent you may have; there are plenty of talented people who forfeit the strength, endurance, and power to develop their gift(s). What sets the thriv-ers apart from the languish-ers is their Investedness Quotient. Just as money invested wisely yields dividends that contribute to personal wealth, your Self invested wisely yields dividends that contribute to personal enrichment. When people criticize others saying–“She is so self-centered.” “He is so self-involved.” “How selfish can you be?”–they speak about a particular kind of behavior pattern that alienates others. Self-investedness, however, conveys a focus on the Self regarding what matters most to us, what relationships and activities we pursue, and what dedication of time we allow based on our values, principles, and ideals. I know a young man who is a self-involved drug addict. (As it happens, addicts tend to have low Investedness Quotients.) When I inquired into his motives for developing a drug habit, he blamed it on boredom. My response, had I the opportunity to do it over, would have been, “Get a LIFE, man!” This perpetually regressive adolescent, no doubt, self-medicates pain that he discusses with nobody. But more than that, he lacks self-investedness, and this down-fall defines him unless and until he takes steps to invest in himself. What do such steps look like? A rational decision to love ourselves enough not to pollute and impair ourselves. A regular involvement in pro-social activities–to leave situations better than how we encountered them. A daily commitment to be of service to at least one other human being. A generous dedication of time and attention to a rewarding skill or ability. A judicious willingness to share about our pain (sorrows, frustrations, anger, etc.) with a person wiser than us. A heartfelt endeavor to assume responsibility for shortcomings and to make amends as warranted. A bold admission that, if there is a Higher Power, each of us is not it. A continuing inquiry into what these steps look like in our uniquely personal experience. If you are ready and willing to self-reflect, re-evaluate your behavior, and make judicious decisions about your Life, please Contact Vanessa Landau, Resiliency Trainer, for Co-Creative Transformation, and we will develop a “portfolio” that makes you rich. The greatest gift that we can ever give to people and the world is the example of our life—our claim to fame. It is the only gift that, as individuals, we alone can give. The gift speaks to matters of character. Everything that we ever embody–qualities, values, principles, beliefs, opinions, ethics, morals–colors our responsibilities (our ability to respond) and contributions, and our reputation stems from the pattern that we thereby establish. When people discover that I have a trauma background–challenges, hardships, adversities, illness, injustice–and they also discover that I have become a strong, spiritual, insightful, compassionate, courageous, resourceful, and tenacious individual rather than a bitter and brutalizing one, people ask me how I managed to embrace a Loving legacy. First, I must confess that, in my darkest times, I have been bitter and brutalizing. There are sins of speech and deed for which I must account, and I live with the burden of remembrance for inexcusable behavior. My conscience, despite apologies, rages at me. Because of this, self-reflection, re-evaluation of my actions, and genuine amends shape my personal development. Despite occasions of contemptible behavior, my reputation and the overarching example of my life demonstrate my conviction to uplift myself and others. From an early age, I nurtured a curiosity about people who, despite disadvantage, forged an honorable and admirable legacy—Helen Keller, Anne Frank, Martin Luther King, Jr., and everyday people spotlighted in the media. The gifts of others’ examples prompted my resiliency. I further owe my resiliency to my ability to self-reflect, my willingness to seek recovery and accept help, my capacity and desire to give and receive love, and my cultivated gratitude. Clearly, my life has not proceeded as planned. The story of my life defies all early indicators that I would go on to enjoy a priceless marital partnership, to contribute to society through a stellar career, and to craft a retirement of continuing contributions. Yet there remains a single legacy that I aspire to leave in my wake–this above all else–that I chose Love and loved well. What is the gift of the example of your life—your claim to fame? What is the first next right thing that needs to happen within you in order for you to realize this? What reputation stems from your responsibilities and contributions? What is the legacy you aspire to leave in your wake? We await your inimitable reply! If you would like to build your character, shape your reputation, and forge a legacy, please Contact me, Vanessa Landau, Resiliency Trainer, for Co-Creative Transformation, and we will claim your fame together. The 4th of August marks the 28th anniversary of my sister Heidi’s suicide. She had been a patient in a state psychiatric facility at the time. The belt from a robe became her noose. A fellow patient found her hanging in the shower. She had left no note. I physically feel the terror of the horrific course of events. How could Heidi come to conceive this ending to her life? How long was she suffering with suicidal intent? Was the gesture impulsive or did she know when she awoke that morning that this would be the last day of her life? — What actions can we take to postpone the decision to act on a suicidal impulse? — Whom will we tell about the immense pain that spurs thoughts of suicide? — What are/were our dreams? What one thing can we do to sustain them? — Who would wish for us to live? What one thing can we do to return in love to others? The critical aspect of the Suicide Aversion Plan is that it must command full credence, having been composed by the rational mind, even if the suicidal mind tries to argue against it. Our full faith and trust must remain with our rational self. The immense pain that spurs thoughts of suicide will change and will pass. If we are incapacitated by the pain then we must convalesce. Treat yourself with the utmost of tender care. A wise person once gave me a sign that read: Keep breathing! I always thought that meant to not hold my breath, a rigidity that suppressed feelings. Only recently did I realize that this was an instruction to release anything that impelled me to kill myself and therefore stop breathing! Keep breathing! If you are feeling suicidal, resiliency education is not of utmost importance right now. If you are in imminent danger, please call 911 or go to your nearest emergency room, preferably at a hospital that has an excellent reputation for behavioral healthcare. If you need to see your psychiatrist or psychotherapist on an emergency basis, please contact him/her and express the urgency. Often circumstances in life are beyond our control, and the unknown or unfavorable outcomes can instill discomfort. One human response is to control whatever we can control as compensation for that discomfort. In 1988 I experienced a great lack of control in various areas of my life–e.g., family, school, friends, self-image. My attempt to grasp control expressed itself as an eating disorder. The one thing I could absolutely control was food. I believed I was in control but, in fact, when I tried to stop restricting food and vomiting what I did eat, I discovered that I was powerless. The addiction had taken over control. Another way in which we attempt to grasp control over circumstances is to anticipate all possible outcomes and thoroughly prepare, particularly for the outcomes we FEAR. We think that if we are ready for the imagined misfortune or catastrophe, somehow we will be able to control it. The truth is that, while some preparatory measures suggest intelligence and reduce the element of surprise, focusing on the outcomes we fear render us no more effective in controlling them than if we focus on the outcomes we desire. Some people become so radicalized by a FEAR of lack of control that they impose control on others. Have you ever known anyone who has a monopoly on how to fold clothes? fill the dishwasher? re-close the cereal box? Have you ever known anyone who arbitrarily tells you what to do because they have appointed themselves to be in control. My housemate forbade me to use my laptop at the dining table–even when nobody was eating there–because I had a computer table upstairs. Control presents a tricky dynamic. Societal influences suggest that we are in control of our own destinies; that we create our own lives; and that, when we feel disappointed, despondent, or devastated, we must accept the responsibility for that. Such notions deliver half-truths. We shape our destinies given what circumstances arise. We make choices about action given the access to resources at our disposal. We remain responsible for our actions and attitudes, and how we learn our lessons. When I find myself in circumstances that I cannot control, I habitually invoke The Serenity Prayer. With practice, I have learned to manage my FEAR of unknown or unfavorable outcomes in constructive ways, and have ceased obsessive controlling behaviors and controlling the behavior of others. Healthy coping strategies involve surrendering control where we have none and ceasing attempts to control others. If you would like to foster skills that support these strategies, please contact me, Vanessa Landau, Resiliency Trainer, for Co-Creative Transformation, and I will guide you in the development of coping tactics.